1973 Ron Wade Spoon Knee Board 4 ft 8"
Stringerless blank, Volan glassed with pigment laminate on bottom, black resin pinlines. 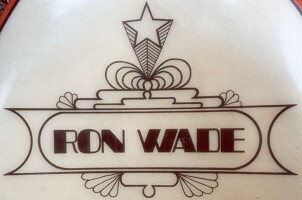 Deck: RON WADE script with decoration, black on nose. Deck: Post production Ron Wade signature in black ink. RON WADE SPOON KNEEBOARD early 70's, 8/10 all original classic, very hard to find in this condition. Thanks to temporary surfresearch assistant for board holding. See below. 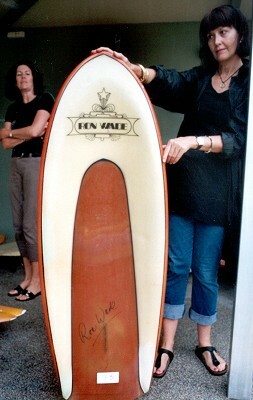 Ron Wade shaped for several Brookvale surfboard companies before staring his own label around 1968 at Mona Vale. Because the high performance capabilities of the design were only achievable in quality waves and the low floatation meant that only the most fit riders were able to catch waves, by 1973 the design was largely supplanted by Peter Crawford's Slab design, circa 1969, see #83. Initially Peter Crawford simply filled in the spooned deck to greatly increase floatation and expand the wave range, but over a long life the Slab was apadpted with a range of rail shapes and fin configerations, see #58. 2.Crystal Voyager David Elfick 1973.
re : #320..."Possibly shaped by Ron Wade". I confirmed this with Ron as I had a suspicion Ted Spencer may have shaped the spoons. Ron told me he made nearly all the spoons. 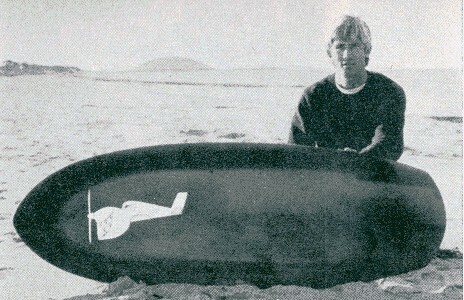 That board is of the Velo type early spoons, Ron Romanosky made "Mellow Velos" with less depth in the hull. Velo's were made exclusively until Greenough produced "edge boards" that featured Chines (Crystal Voyager) and Runners (Fantasea). I've attached a few pictures of my 1967 Ron Wade Spoon. ... I really enjoy riding my spoon. Thanks to Josh for his contribution. 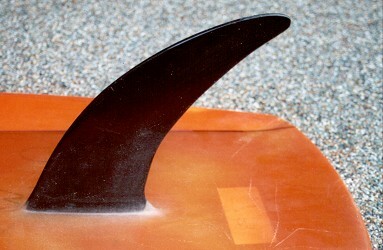 The shaping credit has been adjusted to "Probably shaped by Ron Wade." Ron Wade Spoon, circa 1973. Thanks to the temporary surfresearch assistant for holding the board. Apologies for the lack of a personal credit. 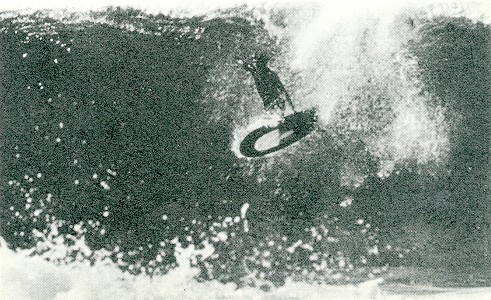 George Greenough - North coast freefall 1965. First published Surfing World Vol ? No? 196? The most outstanding photograph of committed high performance surfing up to this date, this level of performance was probably not achieved by stand up surfers for another ten years..